On February 28, 2007, New Horizons finally encountered Jupiter 13 months after its launch. 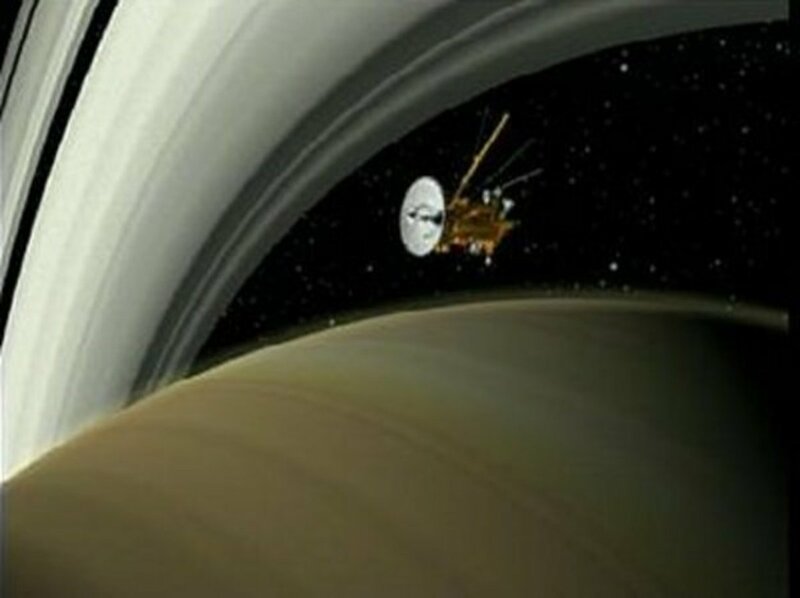 This was incredibly fast - 5 times sooner than Galileo and 3 times sooner than Cassini. 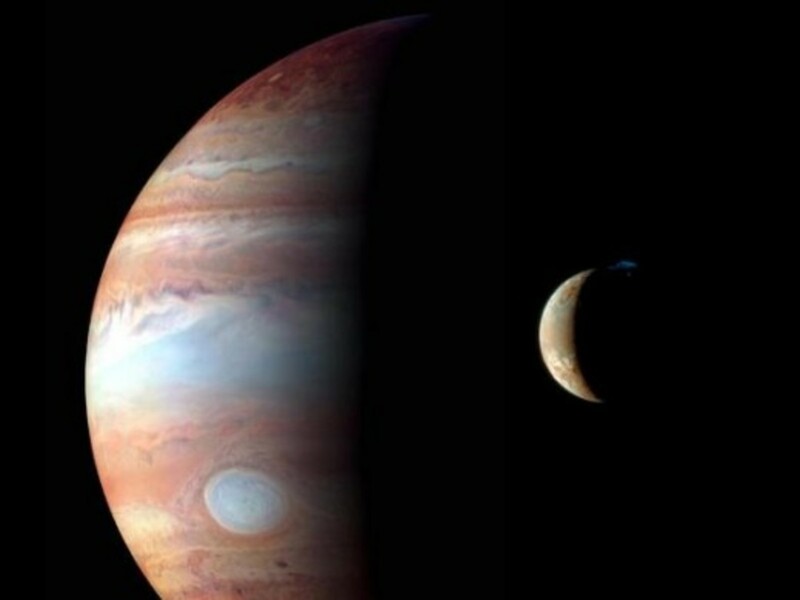 NASA turned on New Horizons instruments and began to look at Jupiter and its moons while taking pictures as well. Even though the gravity assist occurred the next day, New Horizons continued to observe Jupiter until June of 2007. After the assist, New Horizons now travels 35,000 miles per hour on its 3 billion mile trip (Stern "The New" 1, 11; Dunbar “NASA," Stern "NASA" 24). Only 2 months of every year saw New Horizons turn on its instruments to ensure that they were operational as it moved to Pluto. Because it took 9 hours for signals to travel from New Horizons to us and back, the probe had to do most of the science automatically. The actual flyby was quick, and the total amount of observational time amounted to a few months. Also, because New Horizons transmited data at 1000 bits (not bytes!) per second, it took over a year for the full results to even reach NASA (Stern "The New" 11, Fountain 2, Guterl 55). In January of 2015, New Horizons was woken up to begin its 6-month long mission on Pluto, which was 135 million miles away when the probe was turned on. Using its LORRI equipment, New Horizons began taking pictures of Pluto to help triangulate its position and maintain its course. As the probe neared Pluto, it was also taking data telemetry on particles including solar wind and interstellar dust and taking additional pictures of Pluto. Pictures from mid-April of 2015 began to show surface details, including a potential polar ice cap. 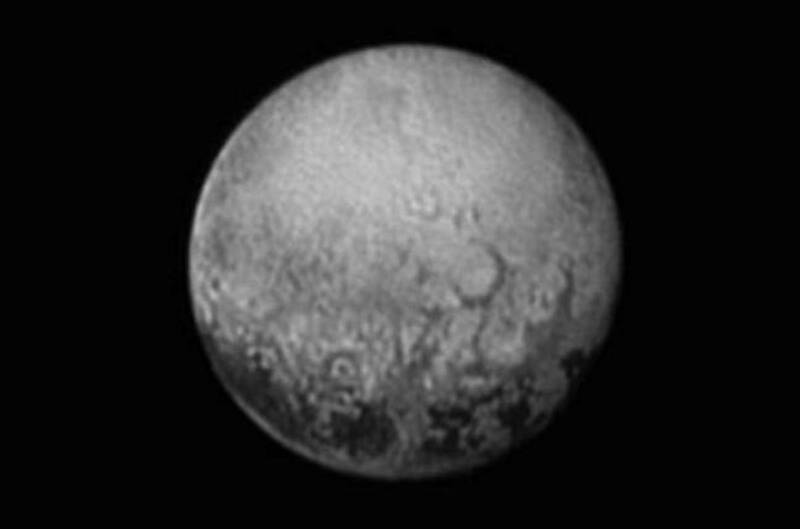 The resolution improved and improved until the best pictures of Pluto ever were taken during the flyby (Johns Hopkins 16 Jan). A brief scare was encountered by all when the probe entered safe mode 9 days before the flyby, preventing science from being collected. Fortunately, the problem (a timing error in preparation of the flyby) was resolved quickly and everything was back on track (Thompson "New Horizons Enters"). The days passed by quickly and New Horizons was already beginning to see features which would not be visible as the flyby occurred due to the hemisphere proximity. This included four spots which seem to be connected to each other and spaced at a seemingly regular manner. 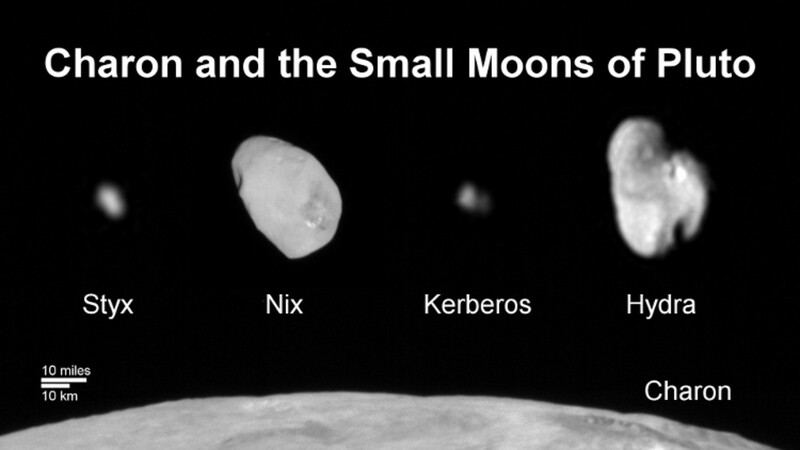 They are about 300 miles wide all together and have sharply defined boundaries of light and dark, according to New Horizons program scientists Curt Niebur. Another interesting find prior to the flyby was the size of Pluto was finally determined to be 1,474 plus or minus 4 miles wide. Previous efforts had been thwarted because of Pluto's atmosphere obstructing a definite reading. The official Mission specialist Bill McKinnon of the Washington University in St. Louis and the team came to this conclusion based off readings from the LORRI instrument which were also looking out for Nix and Hydra. This makes it the largest KBO known to scientists at this time and also revises its volume and therefore density, having further implications as to its composition. The official value is now 1.86 +/- 0.01 grams per cubic centimeter., pointing to a 60% rock, 40% ice make-up. And if this wasn't exciting enough more details emerged about the side that New Horizons would get to image in high-resolution, including what seemed to be a giant heart! The anticipation was killer (John Hopkins 11 Jul, John Hopkins 13 Jul, Chang, Stern "The Pluto" 26). As New Horizons flew past Pluto and Charon at 30,800 miles per hour on July 14, 2015, its closest approach was at 7:49 am eastern time at 7,690 miles, just 74 seconds early and only 45 miles off! Of course, to ensure that the flyby was a maximum gain event the New Horizons probe did not transmit any data until the flyby was well over. Scientists like Alan Stern had to wait over 13 hours post-Pluto flyby to know if New Horizons had even survived or had fallen victim to a possible space collision. But it had indeed made it through and started to send some amazing pictures that blew scientists away. A heart-shape feature was indeed on Pluto and Charon did have a dark red pole, just as preliminary data suggested (Boyle "Its", Chang). Despite the long download time for the data, scientists have had plenty to sink their teeth into. Within the initial download on the same day as the flyby many discoveries were made. The 3-filter color images that the RALPH instrument was able to capture shows differentiations in the surfaces not visible in the visible spectrum. Interestingly it shows that Pluto's "heart" is not a whole feature but rather two distinct halves made of different materials with one side being smooth and made of carbon monoxide ice (possibly indicating a young age) and the other full of craters (possibly indicating an old age) (Stern "The Pluto" 25, Boyle "New From," Talcott "Pluto", Hupres). The next day offered even more surprises, including mountains. Located along the western edge of the heart-shape feature on Pluto (informally known as the Tombaugh Regio), they offered some tantalizing and shocking clues about what does on geologically. Some of them are higher than the Himilayas at over 11,000 feet and instead of being made of rock are composed of water ice. The images showed no signs of impact craters, leading scientists to think that the mountains are young, probably no more than 100 million years old. But as to what could have allowed much of Pluto to have this youthful appearance was unknown but the best theory was radiological decay causing the interior to be warm enough for resurfacing. What caused this heat? Well, tidal heating caused by gravitational pull cannot be occurring here because nothing is pulling hard enough because of a lack of mass. To put it short: We don't know the source of the heat. In another part of the Regio, small pits next to mountains in Sputnik Planum seem to have arisen from sublimation of carbon monoxide/nitrogen ice of the plain into gas (Freeman, Yuhas, Stromberg, Calderone "The Biggest", Thompson "First," Powell). 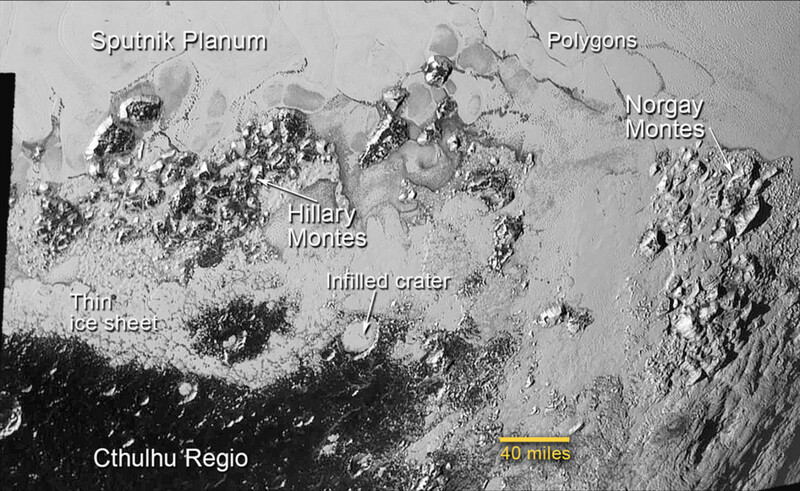 Also found on the surface of Pluto were these huge mountains named the Norgay Montes and the Hillary Montes. 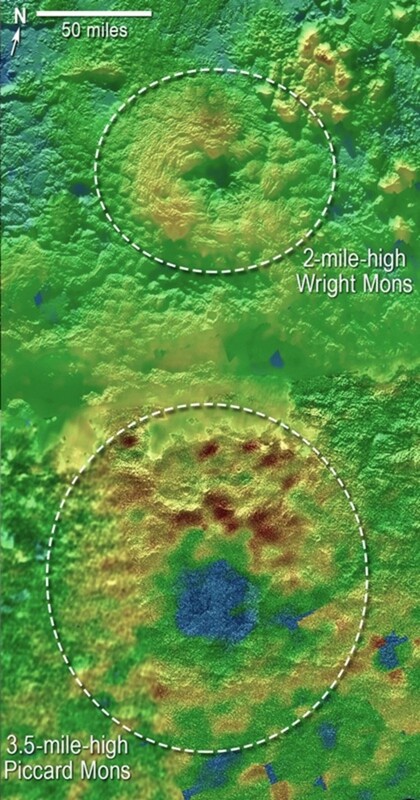 As tall as the American Rockies, the Montes are too big for them to be made of the ice seen in Tombaugh, for that material is weak on Pluto and cannot withstand the 0.06 g environment. The nitrogen, methane, and carbon monoxide ices seen on the surface just can't bear the structural load the mountains require. So what can they be made of? Maybe if they were composed of water ice, we would be in luck. If true, it would hint at a water ice mantle with a rocky core, based on those density readings. In fact, as much as a third of Pluto could be water ice based off the density readings seen. Another mountain range seen on Pluto was the al-Idrisi Montes which hinted at some layering on Pluto's surface, and nestled in it is Alcyonia Lacus, a potentially frozen liquid nitrogen lake (Stern "The Pluto" 27, Stern "Hot" 32-3, Stern "Puzzled" 26). Shortly after the first image of Hydra was released, a methane map of Pluto was displayed from infrared measurements. 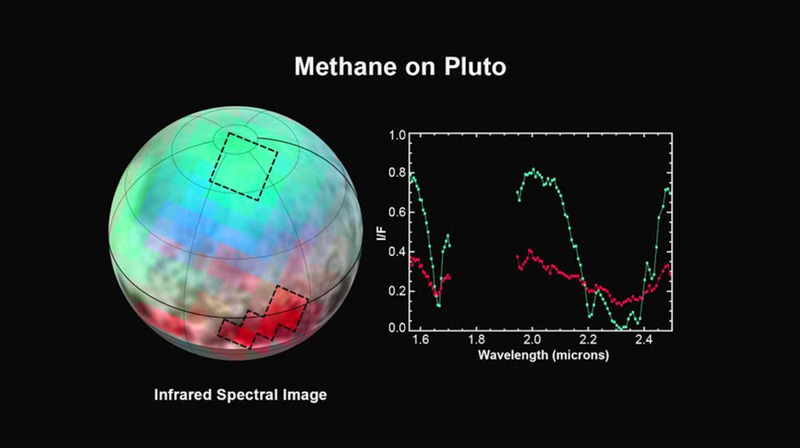 The different colors refer to the different types of methane ice present on the dwarf planet. 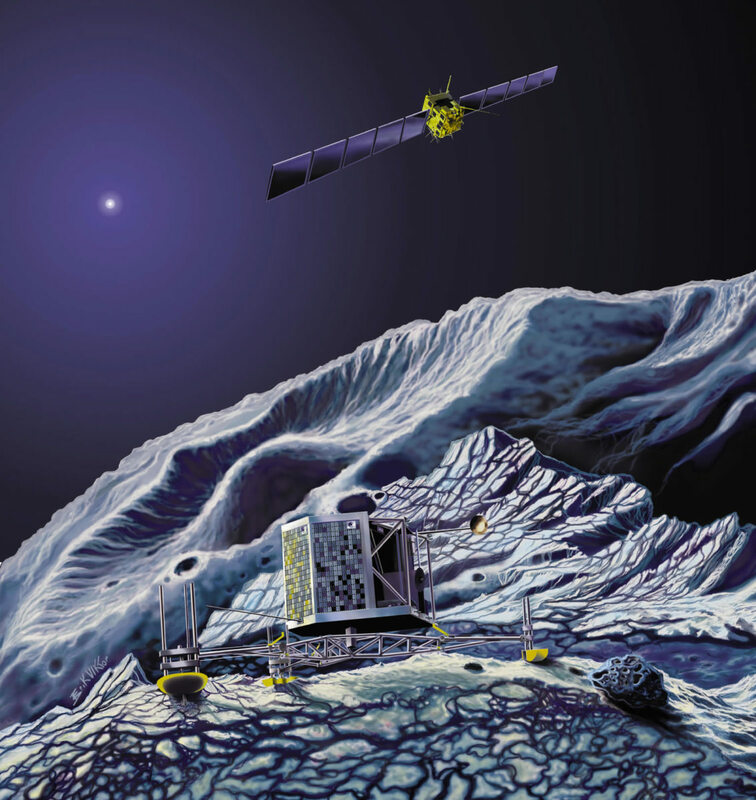 Other surface measurements indicate that it is all ice and is 90% nitrogen and 10% methane. 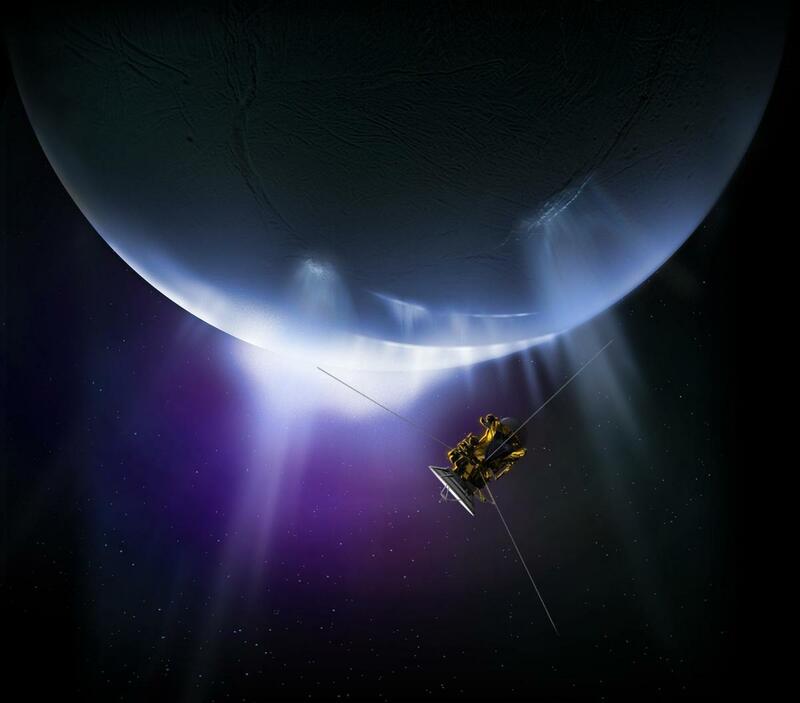 The different colors seen could be due to particulates like tholin (which absorb blue light and reflect red like most organic materials), age of the ice, or concentrations of the nitrogen and methane (Freeman, Yuhas, Stromberg, Betz "Pluto's Bright", Thompson "First," Hupres). Scientists have known about the atmosphere of Pluto thanks to many occultations but the size of it was unknown until now. Measuring in at 1,650 miles above the surface, it was not only larger than expected but also colder and more dense than anticipated (see the section on haze for more on that). But what was even more surprising was what the SWAP instrument detected behind Pluto: a comet-like tail spanning 48,000 to 68,000 miles! The low gravity of Pluto means it cannot hang onto any gases for long so its escapes the surface, being deflected by the solar wind into a tail. It is made of ionized nitrogen and forms a plasma which allows the solar wind to carry away up to 500 tons of it each hour. Despite all of this, Pluto maintains a 7-10 microbar surface pressure (about 0.001% that of Earth's) and only has lost half a foot of total atmosphere depth to space since the formation of the solar system (as opposed to the old-school though of a half mile) (Thompson "First," Calderone "NASA," Betz "Pluto's Icy," Stern "The Pluto" 26, Talcott "New"). 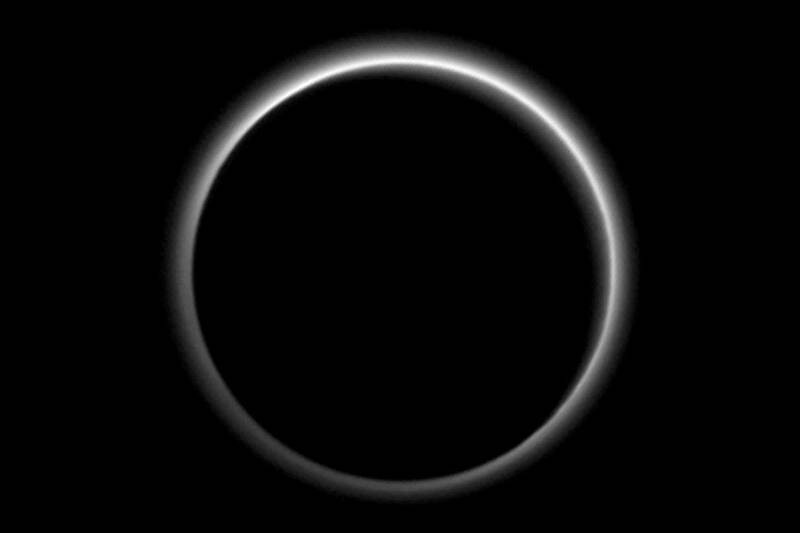 July 24 of that year, just 10 days post flyby, saw NASA release a picture of Pluto backlit by the Sun. The outlined dwarf planet shows two haze layers with one 30 miles above the surface and the other 50 miles above, going up to 80 miles high. These layers are not that dense - just 100,000 times less than Earth's atmosphere. The production of the haze is a little complicated, so buckle up. Methane gases in the atmosphere of Pluto get broken down by UV light and converts it to ethylene, acetylene, and other complex hydrocarbons called tholins which are red in color, produce a blue appearance similar to what nitrogen and oxygen in our atmosphere scatters, and are 0.1 to 0.5 microns in size. This also releases heat via infrared rays and cool the haze to about 70 Kelvin. The tholins settle to the lower levels of the atmosphere below 125 miles in altitude where they freeze into icy particles and become haze. It is possible that these can be broken down further by UV light into even more tholins which help give a red tint to the dwarf planet. Some clouds were even spotted, somehow correlated in their movement to the start and ends of a Pluto day (NASA "New Horizons Finds," Thompson "New Horizons Data," Powell, Betz "Pluto Surprises," Stern "The Pluto" 26, Stern "Hot" 30, Wenz "Pluto's Hazy," Stephens). Also released that day was evidence of ice flows on the surface of Pluto. 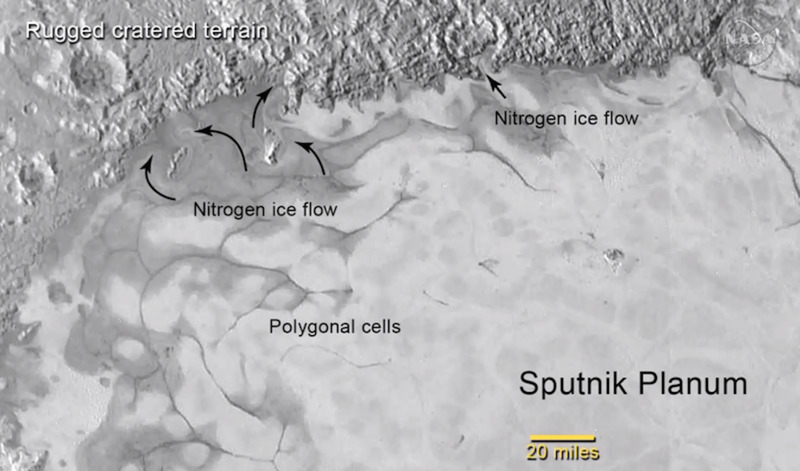 Located in Sputnik Planum (which is over 350,000 square miles in area), the image shows nitrogen ice and the possible migration it makes through the soft ice, like glaciers on Earth. It is another sign of a geologically active world despite the -390 degree Fahrenheit temperature found there. In fact, images of the lower portion of the Tombaugh Regio possible show ice moving over into the dark area known as the Cthulhu Regio. It seems to be a large place where not much activity occurs and combining that with the large craters seen points to an old age (maybe 4 billion years old). Images of Tombaugh and Cthulhu along with other newly named features are on the right (NASA "New Horizons Team," Thompson "New Horizons Data," Stern "The Pluto" 27, Stern "Hot" 32). Alright, so what is the deal with all this nitrogen? Where does it come from? Comets are unlikely to collide enough to constantly replenish the 100's of tons lost hourly. It seems as though the geologically active dwarf planet viewpoint has gained more ground. Somehow, an internal mechanism is bringing nitrogen to the surface. Stern thinks that cryovolcanoes could be a possible delivery system. He also pointed out that for Pluto to be pumping as much nitrogen as it currently is suggests that it is much younger than anyone thought it was, possibly denting Kuiper Belt theories (Lewin). The talk of cyrovolcanoes in the Pluto system heated up when Wright Mons, Kubrick Mons and Piccard Mons on Pluto were identified as being similar to shield volcano-like structures on Mars and Earth. The 100 kilometer wide rim around shallow but gentle depression slopes points to a collapse of the surface once material from below vacated it. That material could be driven by convection of some sort. The likely material of the cryovolcano based on those convection models would be a mix of nitrogen (as theorized before), ammonia, methane, or even water ice. And with a lack of craters in Sputnik Planum and a general lack of old craters anywhere on Pluto hints at both an active surface but also at a lack of small objects colliding with the dwarf planet. In fact, the Tombaugh Regio seems to be 1 billion years old while Sputnik Planum is 10-30 million years old! 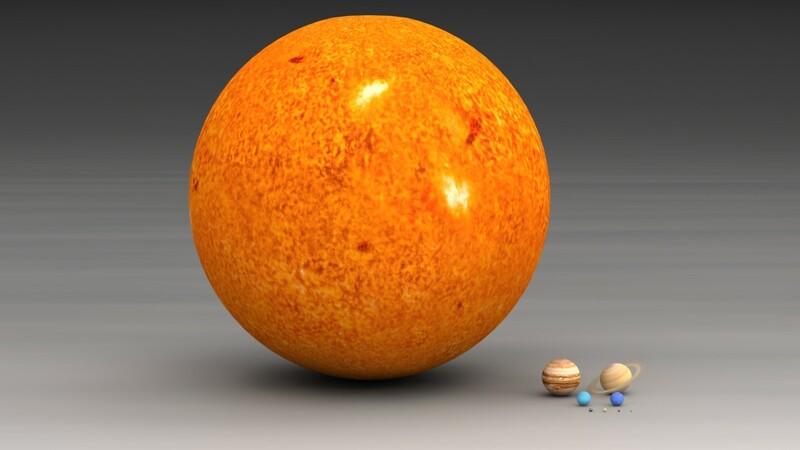 It hints at a shocking picture: that KBO's did not form through accumulation of smaller objects but rather formed as large objects near their current orbit. Solar system formation theories will need potential revising if further data confirms this (NASA "Pluto May Have," Berger "Volcanoes," Talcott "New," Stern "Hot" 32, Purdue, Stern "Puzzled" 26). December of 2015 saw more information being released as well as new images. Amongst the findings released as continuing evidence for past and present geological activity on Pluto and with this the formation of interesting valleys that result from erosion. Sputnik Planum had its temperature readings released also, and they paint a picture for the nitrogen ices seen there. The way the heat flows in the 620-mile wide region causes the interesting polygon formations seen, and also how certain features travel around. Based on the heat, the plain is likely a few miles deep. Also mentioned was the lack of any new moons despite New Horizons looking for objects 20-30 times fainter than Nix (NASA "New Findings," Stern "The Pluto" 28). Near the end of January 2016, the New Horizons team released a false-color map of Pluto's surface uncovered by LEISA to show how water is distributed. The image on the right shows all the water on the surface while the map on the left shows where the water is from bedrock, known due to the gases like methane obscuring material. While the map shows more water than scientists suspected there was, it also points out an interesting absence of the material in Sputnik Planum and Lowell Regio, perhaps indicating how their age plays a role in the surface of Pluto. 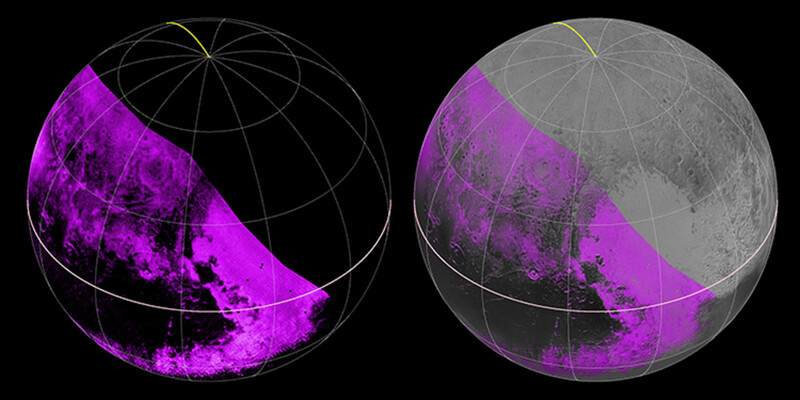 Also, water levels on this map corresponded to the red areas on the dwarf planet, perhaps indicating a correspondence to tholins and water production (NASA "Pluto's Widespread," Betz "Pluto Surprises"). In March of 2016, a connection was found between the mountains of Pluto and its atmosphere. Turns out the dwarf planet has another parallel to Earth: snow on mountains. Yes, mountains in the Cthulhu region seem to have brighter tops than the rest of the tholin-covered terrain. And when we compare these tips to methane ice distributions around the mountains, we have a match. And where does that methane come from? The atmosphere, where the methane condensed and fell back to the surface. At the altitudes of the mountains it remains in its frozen form (Berger "NASA May"). Remember those nitrogen ice flows in Sputnik Planum? Scientists suspect that it acts like a giant "lava lamp." In a June 2016 press release, William B. McKinnon (from Washington University in St. Louis) and colleagues laid out their theory, which was based off imagery and computer simulations. Whatever is heating Pluto internally (likely a radioactive material) gets things hot enough to melt the nitrogen (which normally would be at 35 K) into a liquid, which rises because of buyoncy. As it nears the surface, it cools off until becoming solid again and sinking back down. In addition, this ice easily changes shape because of the lack of strong bonds between nitrogen atoms. All of this creates flow patterns like an uprising convection cell, which matches what images we have of up to 50 meter height differences between cells. But according to the simulations, the flow is slow, about a few centimeters a year. That means it would take over 500,000 years to fully circulate the surface and explain its youthful appearance. But as for why most of the nitrogen on Pluto exists solely in this region, the simulations offer no answers. Simply amazing (John Hopkins 02 Jun, Timmer "Pluto's Sputnik"). And in a rather interesting trend, Pluto joined the ranks of possible ocean worlds in our solar system. Yes, our distant dwarf planet may have a subsurface liquid ocean, based off New Horizon's tectonics data. The shape of the region indicates that a roughly 124 mile long object impacted Pluto there. But this presents a problem: The Sputnik Planitia is the heaviest part of the dwarf planet's surface and is opposite Charon, something that a crater should not be as its mass should be less than the surrounding region. But if Pluto has a free floating surface, then it would solve multiple problems. Density readings indicate that water is on Pluto, but any that is below the surface should have cooled and become ice, causing surface expansions and contractions. Yet we cannot see this, indicating that if water is present then it is liquid and likely more than 62 miles deep. Plus if such a system were present, then the crater from the impact would have been filled with the salty water and help explain the lopsided distribution of Pluto's surface. The question now becomes what could heat the water still after so many years. The signs point to radioactive decay. But another theory that takes the tectonics and density into account is a thinner crust, which leads to different forms of ice that could exist under seen conditions and eliminate the liquid ocean theory (Wenz "Pluto Becomes", Klotz "Pluto Has," Wenz "Pluto's Icy," Wenz "Pluto's Slushy Heart"). 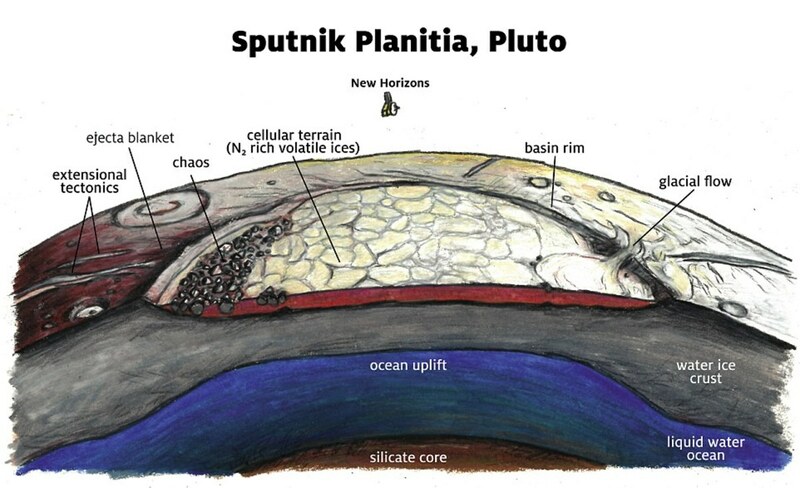 And while an underground ocean helps explain the features of Sputnik Planitia, it is not the only theory to do so. Under the runaway albedo effect, small pockets of ice reflected light and allowed more ice to accumulate as time went on. Eventually, enough was present to apply sufficient pressure to the surface and a basin formed, much like we see today (Klotz "Pluto's Heavy"). In another first, Pluto became the first Kuiper Belt object to emit x-rays! Yes, as unlikely as it seems like it should be the dwarf planet is sending them out, but how? No one knows, for nothing energetic enough to produce them should happen that far out in the solar system. Why? Not enough solar wind nor a strong magnetic field (Hrala). However, dune-like activity was spotted near the al-Idrisi Montes. Based on some perpendicular patterns in the dunes, scientists suspect that they form with winds blowing in that direction rather than along the direction of the dunes. Turns out, when at -230 degrees Celsius nitrogen and methane ice is at a great density to be a particulate and winds can blow snow down from the mountains near the dunes, and simulations show the average size of each grain to be 0.2 to 0.3 millimeters or roughly equivalent to their Earth brethren. Sublimation at the mountains gives the ice particles the kick they need to start moving and the winds take over from there, with gravity finally recapturing them once away from the mountains (Johnson, Parks). At the end of August of 2015 NASA announced that the follow-up to Pluto would be 2014 MU69, an object over 1 billion miles past Pluto, so long as it passed inspection and review. That was achieved on July 1, 2016. At a little under 30 miles long, it was one of 5 objects spotted by Hubble in 2014 as the New Horizons team was searching for the next phase of the mission. Targeted fuel burns got New Horizons to MU69 by January 1, 2019. Another window into the mysterious Kuiper Belt was revealed. To learn more, check out my follow-up (NASA "New Horizons Selects," Wenz "New Horizons," NASA "NASA Releases"). Berger, Eric. "NASA may have found snow-covered mountains on Pluto." arstechnica.com. Conte Nast, 03 Mar. 2016. Web. 05 Aug. 2016. ---. "Volcanoes on Pluto Look a Lot Like Those On Earth and Mars." arstechnia.com. Conte Nast, 09 Nov. 2015. Web. 19 Dec. 2015. ---. "Pluto’s icy plains, pits, and mountains take shape in Tombaugh Regio." Astronomy.com. Kalmbach Publishing Co., 17 Jul. 2015. Web. 19 Aug. 2015. ---. 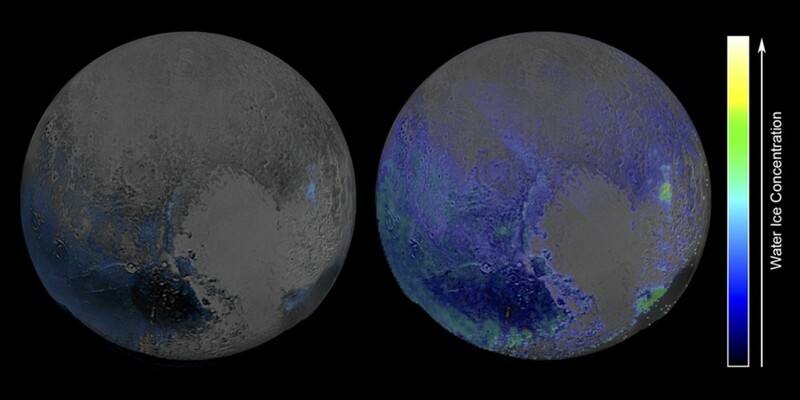 "Pluto Surprises With Blue Skies, Red Water." Astronomy Jan. 2016: 16. Print. Boyle, Alan. "It's Pluto Flyby Day! 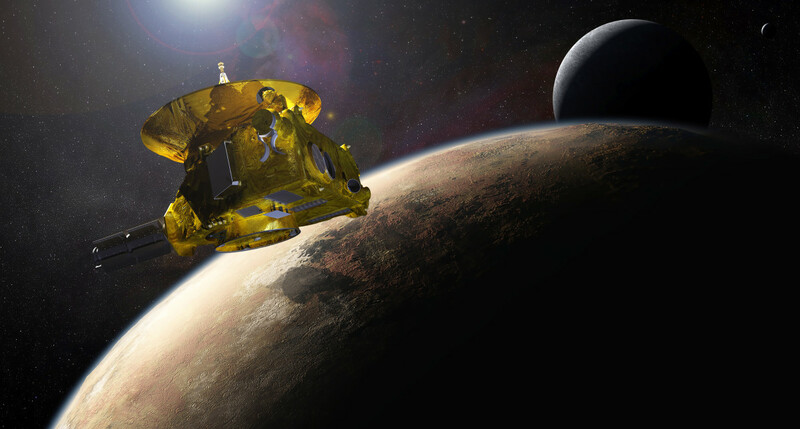 Get In on the Climax of NASA's New Horizons Mission." NBCNews.com. NBC Universal, 14 Jul. 2015. Web. 17 Aug. 2015. ---. 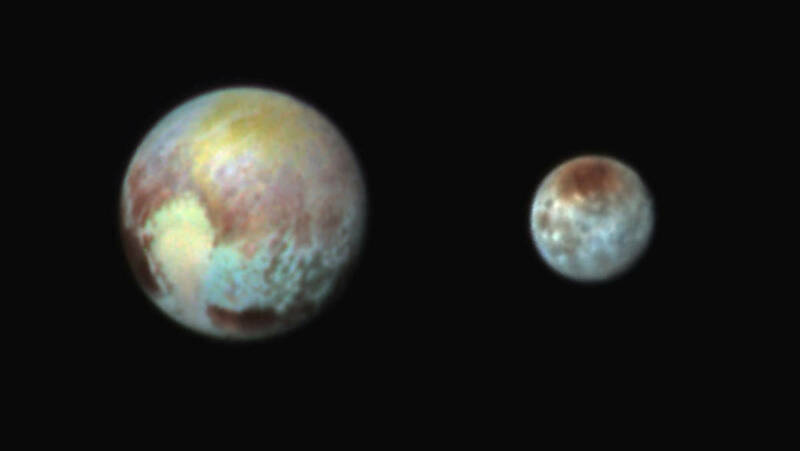 "New From New Horizons: 5 Things We Just Found Out About Pluto and Charon." NBCNews.com. NBC Universal, 14 Jul. 2015. Web. 18 Aug. 2015. Calderone, Julia. "NASA just found something big hiding out behind Pluto." BusinessInsider.com. Business Insider Inc., 17 Jul. 2015. Web. 19 Aug. 2015. ---. "The biggest discovery in new images of Pluto is what scientists didn't see." BusinessInsider.com. Business Insider Inc., 15 Jul. 2015. Web. 18 Aug. 2015. Chang, Kenneth. "NASA’s New Horizons Spacecraft Zips Past Pluto in Flyby." TheNewYorkTimes.com. The New York Times Company, 14 Jul. 2015. Web. 17 Aug. 2015. Dockrill, Peter. "NASA has discovered gigantic ice towers on Pluto, standing 500 metres tall." Sciencealert.com. Science Alert, 10 Jan. 2017. Web. 06 Feb. 2017. Dunbar, Brian. "NASA's Pluto Mission Launched Toward New Horizons." NASA. NASA, 19 Jan. 2006. Web. 07 Aug. 2014. Fountain, Glen H., David Y. Kusnierkiewicz, Christopher B. Hersman, Timothy S. Herder, Coughlin, Thomas B., William T. Gibson, Deborah A. Clancy, Christopher C. DeBoy, T. Adrian Hill, James D. Kinnison, Douglas S. Mehoke, Geffrey K. Ottman, Gabe D. Rogers, S. Alan Stern, James M. Stratton, Steven R. Vernon, Stephen P. Williams. “The New Horizons Spacecraft.” arXiv:astro-phys/07094288. Freeman, David and Eliza Sankar. "Dazzling New Pluto Photos Are The Best Ever Taken Of The Icy Dwarf Planet." HuffingtonPost.com. Huffington Post, 15 Jul. 2015. Web. 18 Aug. 2015. Guterl, Fred. “Journey to the Outer Limits.” Discover: March 2006: 53-5. Print. Haynes, Korey. "Craters on Pluto and Charon show Kuiper Belt lacks small bodies." astronomy.com. Kalmbach Publishing Co., 28 Feb. 2019. Web. 21 Mar. 2019. Hrala, Josh. "Pluto is emitting X-rays, and it's challenging our understanding of the Solar System." ScienceAlert.com. Science Alert, 18 Sept. 2016. Web. 23 Jan. 2017. ---. "New Horizons begins first stages of Pluto encounter." Astronomy.com. Kalmbach Publishing Co., 16 Jan. 2015. Web. 08 Feb. 2015. ---. "New Horizons' last portrait of Pluto's puzzling spots." Astronomy.com. Kalmbach Publishing Co., 11 Jul. 2015. Web. 17 Aug. 2015. ---. 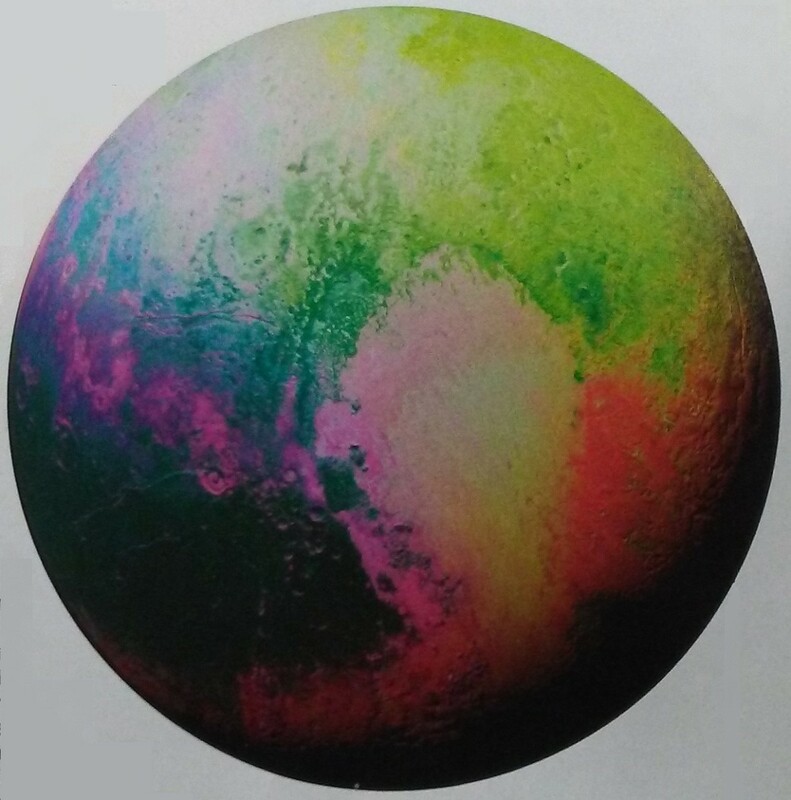 "Pluto's Heart Like a Cosmic Lava Lamp. Astronomy.com. Kalmbach Publishing Co., 02 Jun. 2016. Web. 14 Jul. 2016. 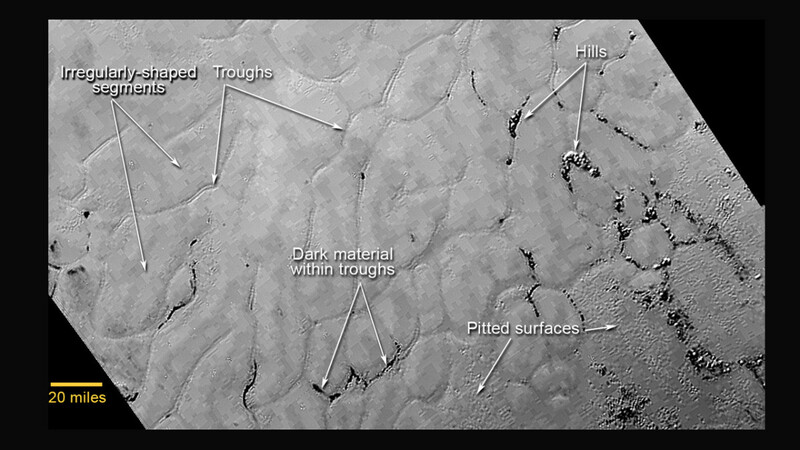 Johnson, Scott K. "Frozen Pluto has wind-blown dunes made of methane sand." arstechnica.com. Conte Nast., 31 May 2018. Web. 13 Aug. 2018. Klotz, Irene. "Pluto Has an Underground Ocean of Water and Slush." Seekers.com Discovery Communications, 16 Nov. 2016. Web. 24 Jan. 2017. ---. 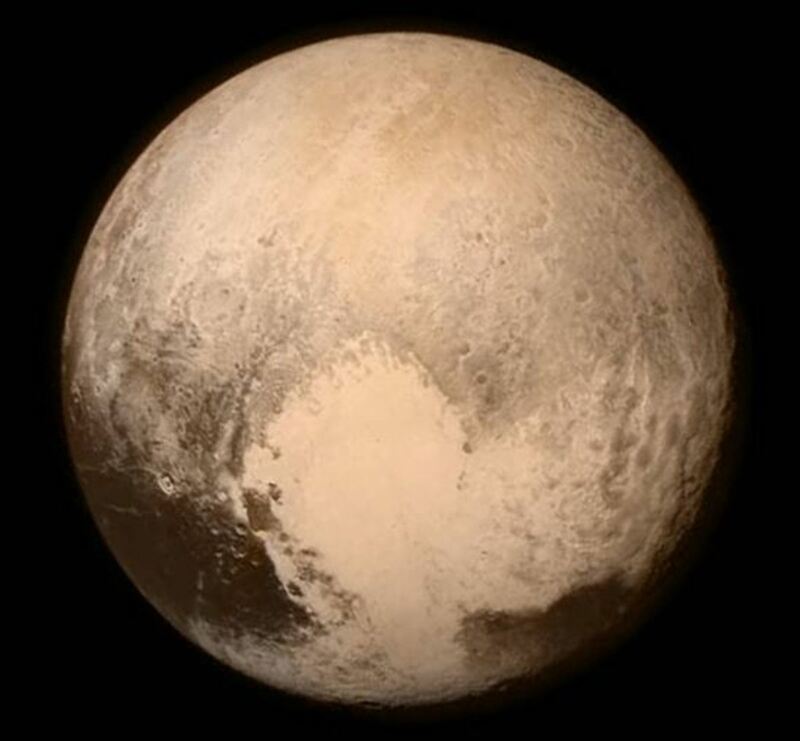 "Pluto's Heavy Heart, Not a Massive Impact, Caused Its Depression." Seeker.com. Discovery Communications, 30 Nov. 2016. Web. 24 Jan. 2017. Lewin, Sarah. "If Pluto Keeps Spewing Nitrogen, Why Is It Still Full of It?" Space.com. Space.com, 17 Aug. 2015. Web. 09 Sept. 2015. NASA. "NASA Releases Record-Breaking Photos From Beyond Pluto." Astronomy.com. Kalmbach Publishing Co., 14 Feb. 2018. Web. 20 Mar. 2018. ---. "New Horizons selects Kuiper Belt target." Astronomy.com. Kalmbach Publishing Co., 31 Aug. 2015. Web. 09 Sept. 2015. ---. 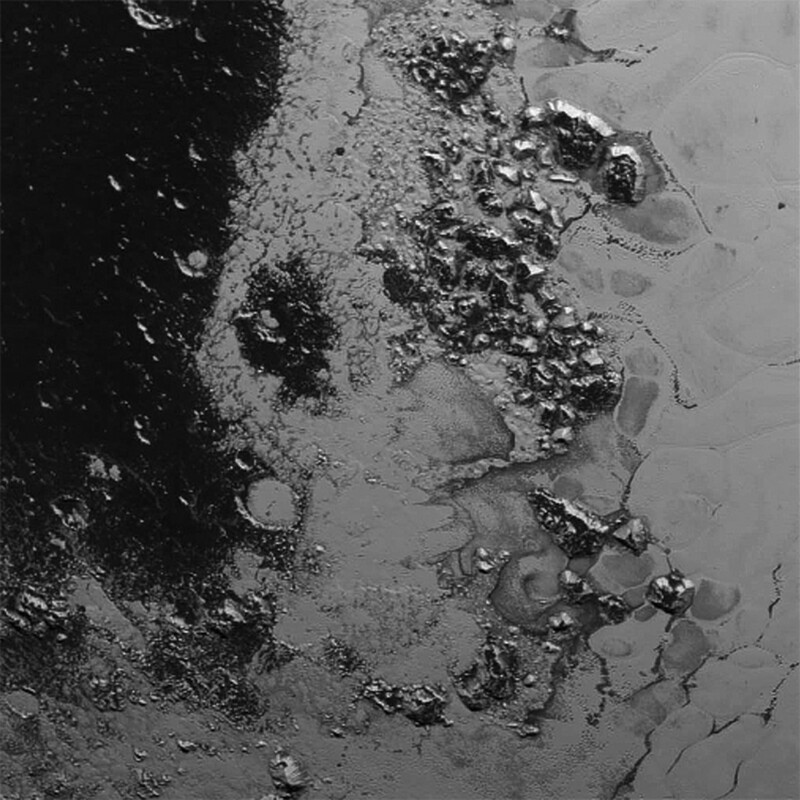 "New Horizons team finds haze, flowing ice on Pluto." Astronomy.com. Kalmbach Publishing Co., 01 Oct. 2015. Web. 04 Nov. 2015. ---. "Pluto May Have Ammonia Fueled Ice Volcanoes." Astronomy.com. Kalmbach Publishing Co., 09 Nov. 2015. Web. 19 Dec. 2015. ---. "Pluto's Widespread Water Ice." Astronomy.com. Kalmbach Publishing Co., 29 Jan. 2016. Web. 10 Mar. 2016. Parks, Jake. "How did Pluto form its mysterious dunes?" Astronomy.com. Kalmbach Publishing Co., 01 Jun. 2018. Web. 13 Aug. 2018. Powell, Corey S. "The Passion of the Pluto-Philes." Discover Dec. 2015: 71. Print. Purdue. "An Ammonia-Water Slurry May Swirl Below Pluto's Icy Surface." Astronomy.com. Kalmbach Publishing Co., 10 Nov. 2015. Web. 11 Oct. 2017. Stephens, Tim. "Pluto's hydrocarbon haze keeps dwarf planet colder than expected." innovations-report.com. innovations report, 16 Nov. 2017. Web. 12 Mar. 2019. Stern, Alan. "Hot Results from a Cool Planet." Astronomy May 2016: 30, 32-3. Print. ---. "NASA Sets Its Sights on Pluto." 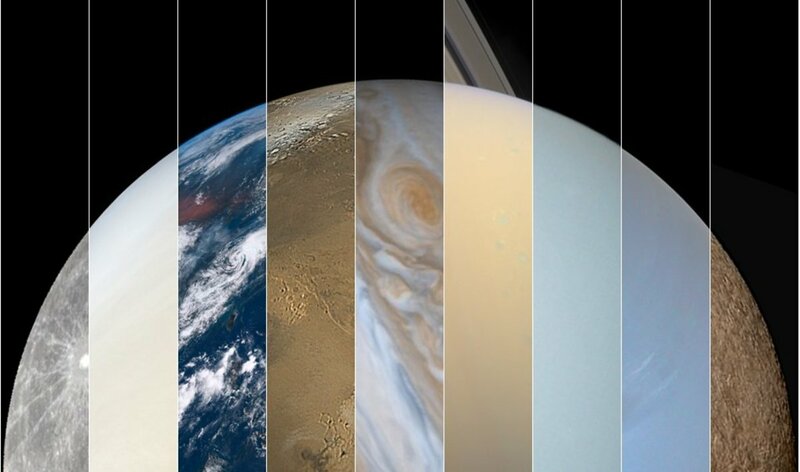 Astronomy: Feb. 2015: 24-5. Print. ---. "The New Horizons Pluto Kuiper Belt Mission: An Overview with Historical Context." Space Science Reviews 140.1-4 (2008): 3-21. Web. 07 Aug 2014. ---. "The Pluto System Explored." 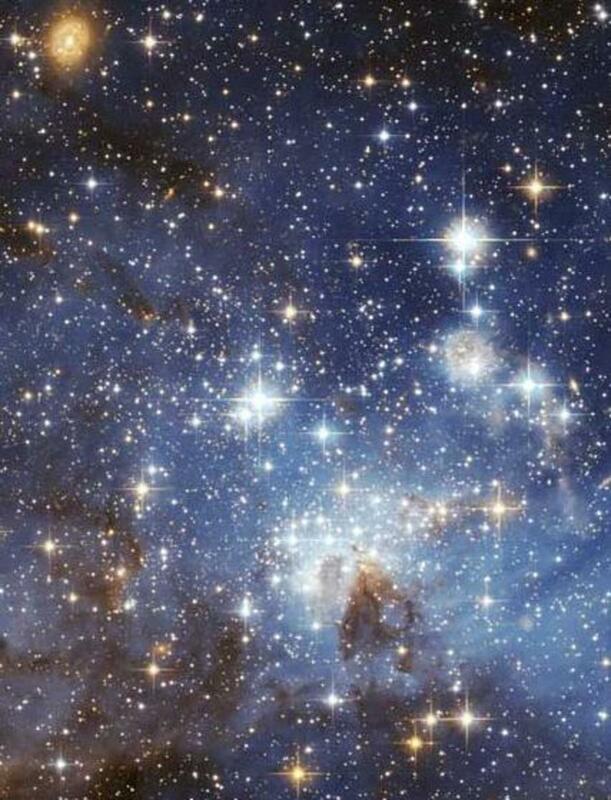 Astronomy Nov. 2015: 25-9. Print. ---. 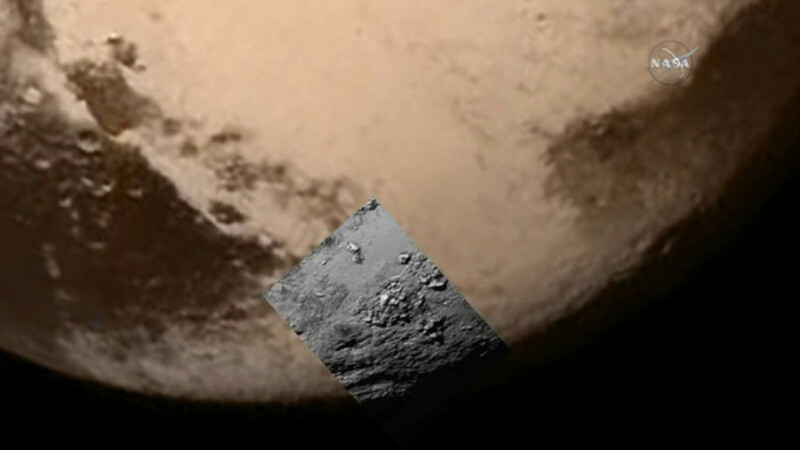 "Pluto and Charon show craters, dark spots, and even signs of snow as New Horizons flies by." Astronomy.com. 14 Jul. 2015. Web. 18 Aug. 2015. Thompson, Amy. "First Pluto data reveals lots of terrain that is “not easy to explain” ars technica. Conte Nast., 17 Jul. 2015. Web. 19 Aug. 2015. ---. 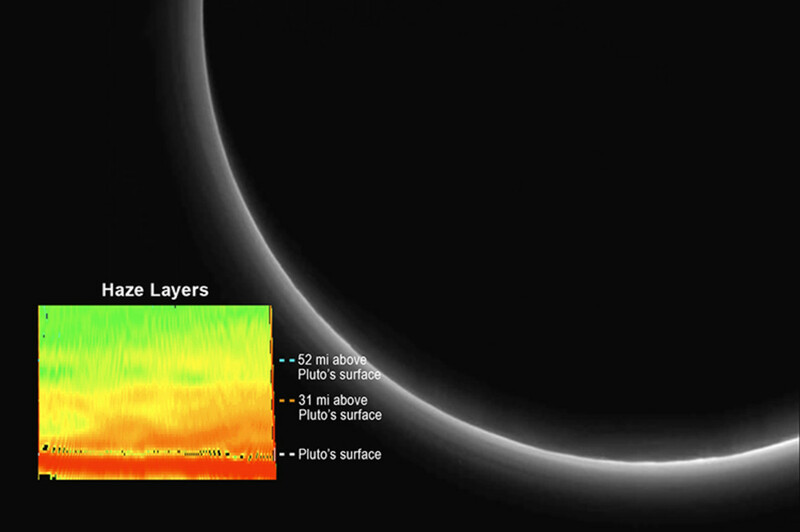 "New Horizons data shows Pluto’s atmosphere, surface features." ars technica. Conte Nast, 27 Jul. 2015. Web. 19 Aug. 2015. ---. 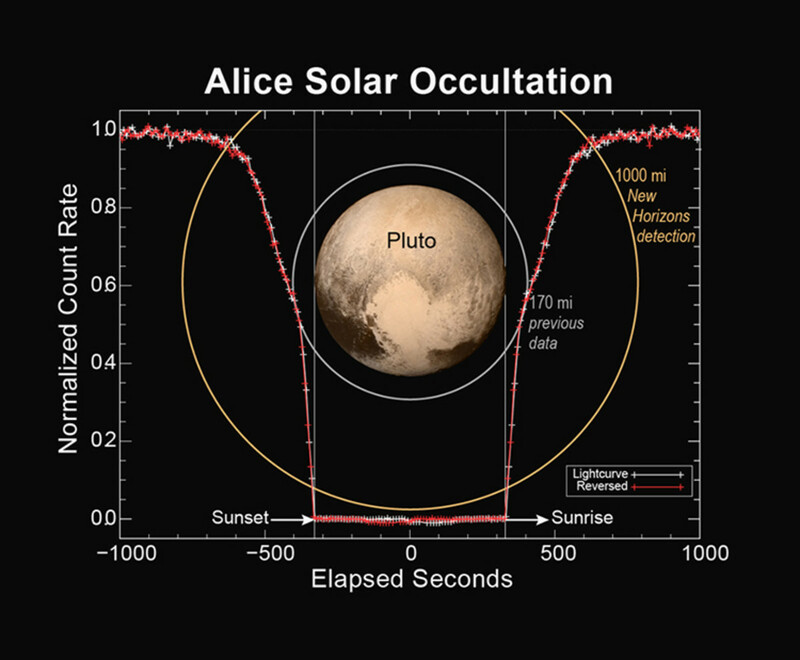 "New Horizons enters safe mode 9 days before Pluto rendezvous." ars technica. Conte Nast., 05 Jul. 2015. Web. 17 Aug. 2015. Timmer, John. "Pluto's Sputnik Planum is an Ocean of Slowly Shifting Nitrogen Ice." ars technica. Conte Nast, 02 Jun. 2016. Web. 14 Jul. 2016. Wenz, John. "New Horizons May Visit Twice the Object for the Same Price." Astronomy.com. Kalmbach Publishing Co., 04 Aug. 2017. Web. 27 Nov. 2017. ---. "Pluto Becomes the Latest (and Weirdest) Possible Ocean World." Astronomy Oct. 2016: 13. Print. ---. "Pluto's Hazy Atmosphere Could Have Large Clouds." Astronomy Feb. 2017: 13. Print. ---. "Pluto's Icy Heart Could Hide a Warm Ocean." Astronomy Jan. 2017: 11. Print. ---. "Pluto's Slushy Heart Contains A Large Ocean." Astronomy Mar. 2017: 13. Print. 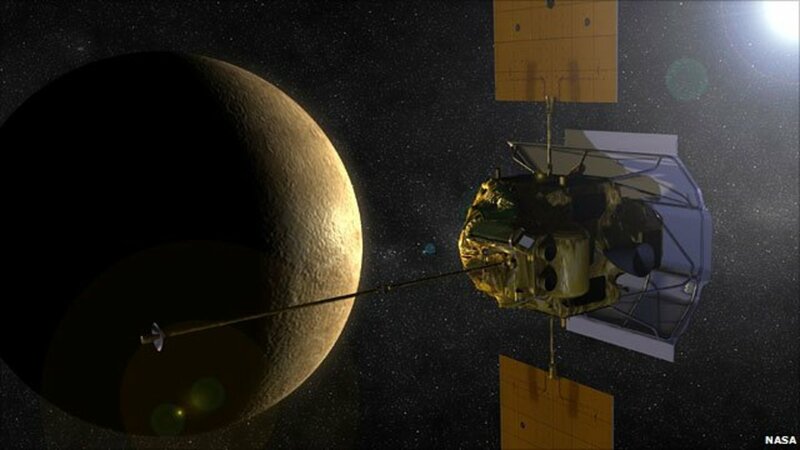 What Was the MESSENGER Spacecraft and Its Mission to Planet Mercury? By all means. I never mind someone citing a hub of mine. I am definitely going to look for that Hub, I may even reference it in the one I am currently writing, if that is okay? I have a hub on the Nice Model which discusses a bit of how that period may have arose. It will be nice to see a hub that goes into the whole story! I'm currently composing a new hub. This topic will be on the Late Heavy Bombardment, as well as other impacts that greatly affected and shaped our solar system. I don't know about more knowledgeable but certainly enthusiastic! I do have a Google Plus website promoting this site but other than that this is it. It would be great though! Thanks Ruth. I am even more excited for the data we haven't seen yet. Excellent work. The New Horizon's was revolutionary to our outer planetary research, I was thrilled to see high definition photo's of Pluto for the first time when the probe arrived.